Just gaze! Get cozy and just gaze into each others eyes. As silly as it sounds, it really does make for an incredibly romantic photograph. Exactly like the one above captured at Joshua tree by Kaysen Photography. Stumped on what to wear, or the ideal location for your engagement shot. 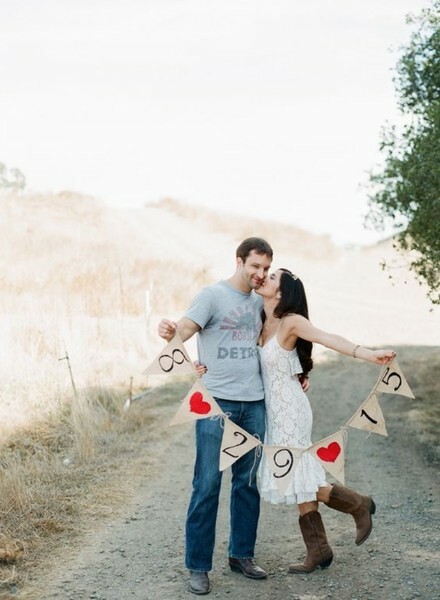 Do not fret we are here to showcase some fabulous engagement photo ideas. Just Jessie and Mike's colorful and fun engagement photo at the beach. Captured by Shannon Lee Miller Photography. You also mus see their wedding here. Just be yourself! Sounds easier said than done, but when taking your engagement photos try to to be as relaxed as possible, it will make for a more memorable engagement session. Tips to staying relaxed during are your engagement session are: 1. meet your photographer in person first, be sure you are comfortable in your outfit, select a location that you are familiar with. You phtotos will turn out as fabulous as the ones captured above by J Wiley Photography. Keep Connected! Engagement photos may seem awkward at first, but the end result will be photographs you will have for a lifetime. Be sure to hug, kiss, stare into each-others eyes as much as possible. You will thank us later for that advice.Captured by Kirstie Marie Photography. Showcase your sports fanatic side. Can you and your fiance be found watching the game on Sunday? If so, then sport your favorite team jersey in your engagement photos. Heck, go to the stadium to capture your portrait like the above couple did, and please note all the details in their photo. Besides custom Bride and Groom jerseys they also have a hand painted football that says Michelle loves David. Captured by Finding Light Photography. Ride your bike. If you love riding your bike together, incorporate that into your engagement photo. To personalize the photo this cute couple put a hand-painted wooden sign with their wedding date on the back of the bike. So perfect for their Save the Date cards. Megan and Michaels fabulous Autumn engagement session in Central Virginia was captured by Dani Stephenson. You can see the rest of their engagement session here. Hold Something! Have your photographer capture you and your love holding something. From a leaf, a piece of wood, a large piece of paper or anything for that matter, so latter your stationer can super impose your wedding info on the image like the one above from 3 Cats Photo. Take the season into consideration. Christmas is such a fabulous time to get engaged, and we suggest embracing when you said, "Yes." Capturing your engagement photo in the midst of the happy holiday will preserve your happy moment in time forever. Captured by Eleven and West Photography. Embrace the military. Don't be afraid to incorporate your military uniform into your engagement photos. Take note, this bride to be even wore anchor earrings to match their, "Navy Military," theme! Photo Captured at the Historic Folsom Military By: Kelly Marie Photography. See their entire engagement session here. Fancy always looks pretty. Jacob and Lily aren't the type of people to take photos but given such special occasion they felt this was the perfect time to capture who they are as a couple on film. They wanted the photos to not only represent our personalities but to be timeless with a touch of whimsy. They dressed up just for the occasion. Lily in a The Lacie 27" Tulle Skirt by Space46 Boutique (ps we might need one of these) paired with a top by Darla Tank by Club Monaco and roller shoes Nine West. This downtown Toronto engagement session was photographed every so beautifully by Julia Park. Bring your own props & DIY paper rose. Lily also made these breathtaking paper flowers for their engagement photos. 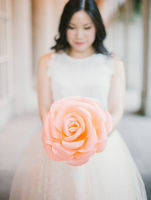 Here is how she did it : The flowers were handmade with doublet crepe paper, 180 gram florist crepe paper, florist tape. 18 gauge florist wire and wooden dowels. Each paper flower was made of 5 tear drop shaped petals and 15 heart shaped petals which were cut from doublet crepe paper, stretched then curled for a more life like effect before being taped with florist tape around a wooden dowel. Leaf shapes were cut out of 180 gram florist crepe paper and taped onto floral wire.Photographed by Julia Park. Planning a big move after your wedding? Be sure to incorporate a location that was memorable to your and your love. JD and Chantal are moving to Texas after their wedding and really wanted to take a chunk of California with them. Danielle Bacon Photography photographed them at El Matador State Beach. Named One of the most beautiful beaches in Malibu, with sea caves and large rocks on the beach. Don't be afraid to do a wardrobe change! Jason Holzworth took Tina and Andrew to a second location for their engagement session, at The Highlands, Louisville KY. They also opted to to change their outfits, so they had a variety of photos to select from. Their second outfit choice obviously reflected their carefree fashion forward attitudes. Tina in Topshop skirt paired with a Alexandra Grecco Gretta Tulle Skirt topped off with Gianni Bini peep toe red shoes. Go to a scenic location. If you have a favorite place that is breathtakingly beautiful, do not be afraid to capture that in a few of your engagement photos, like Jackie and Andy did. They drove quite far away to Silver Lake dunes in Michigan for their engagement photos captured by Kathy Davies Photography. Silver Lake dunes in Michigan captured by Kathy Davies Photography. Similar yet different outfits This may sound silly, but try to coordinate the style of your outfits. You do not need to be all matchy match, but try to coordinate similiar styles. This means if your loves looks ultra fancy, than you look ultra fancy. Just like the adorable couple above hanging at the beach and captured by Ilene Squires Photography. Keep it real and simple Are blue jeans and boots your thing? If so, we highly suggest going with that look for your engagement shoot. Wear what feels comfortable to you. If you are not used to getting dressed up, it will reflect in your photos. Capturing your love, and feeling like yourself is what is most important. Trevor and Kaylene's Ellensburg engagement session captured by Echo Photography is a fantastic example of this. Incorporate your wedding venue Will your wedding be at a winery or apple orchard? Incorporate the location into your engagement photos like Luz and Gabe did for their engagement photos. Captured by New England wedding photographer Sarah Jayne Photographer. Coordinate with your surroundings. Amanda and David obviously took their Michigan surroundings into consideration when planning out their outfits. They seamless blend into their engagement photos captured by Little Blue Bird Photography. Don't think about it and just kiss! Be present, be in the moment and just relish in this beautiful time together. Just like the two above! Beautifully captured at the beach during sunset by Yes Dear Studio. It really does not get more romantic than this.